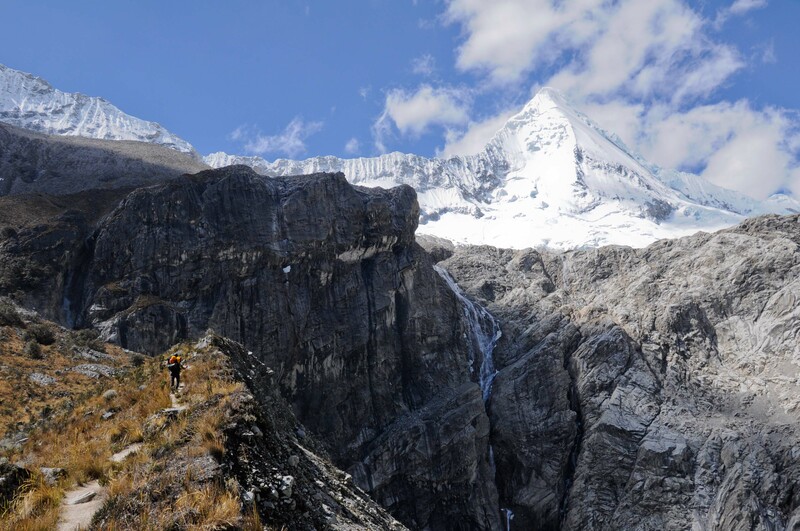 In the mind of the mountaineer, the beauty of a mountain is certainly not an objective matter. 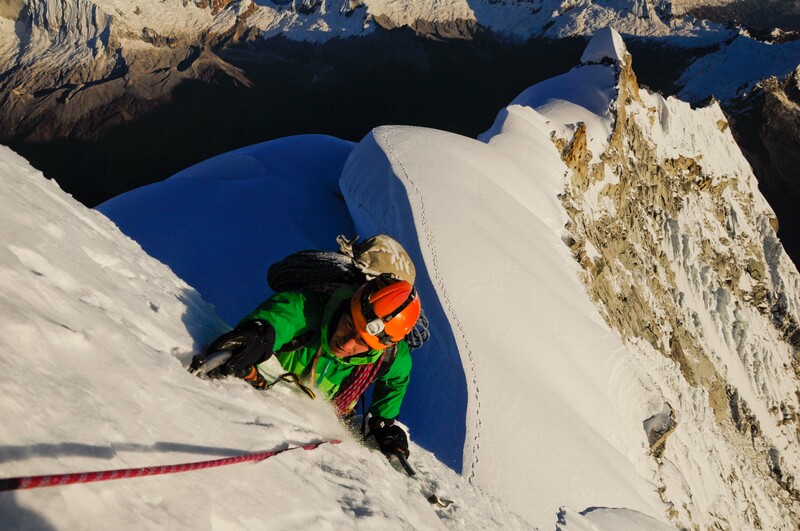 It may depend on the view of the mountain from a particular angle, a particular moment of the day (most often when the first or last sunlight caresses its slopes), a story or adventure that creates a connection with the mountain or sometimes just a picture that has been taken by another mountaineer. 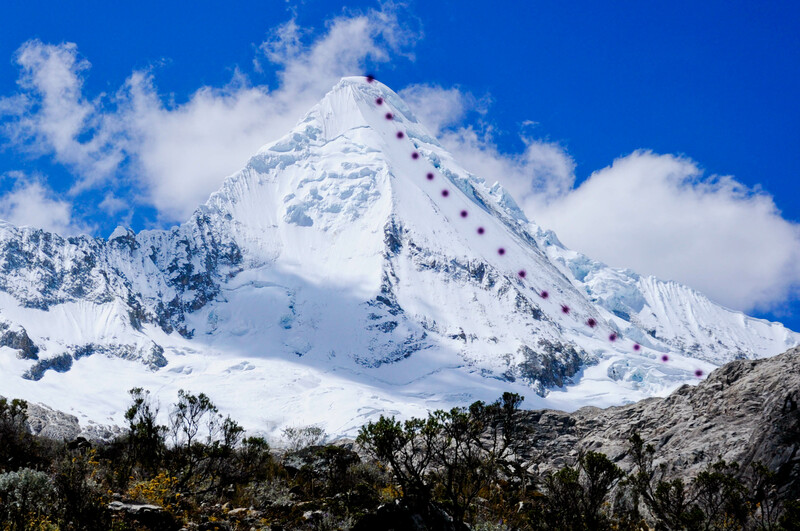 In the case of the Nevado Chopicalqui (6345m), it was a simple picture that awoke our curiosity, even before we knew where the Cordillera Blanca was. To us, the Northwest ridge seemed to be a perfect climb, combining a beautiful mountain with technical difficulties (TD, 2-3 days, source Biggar 1996/ Reedition 2005). 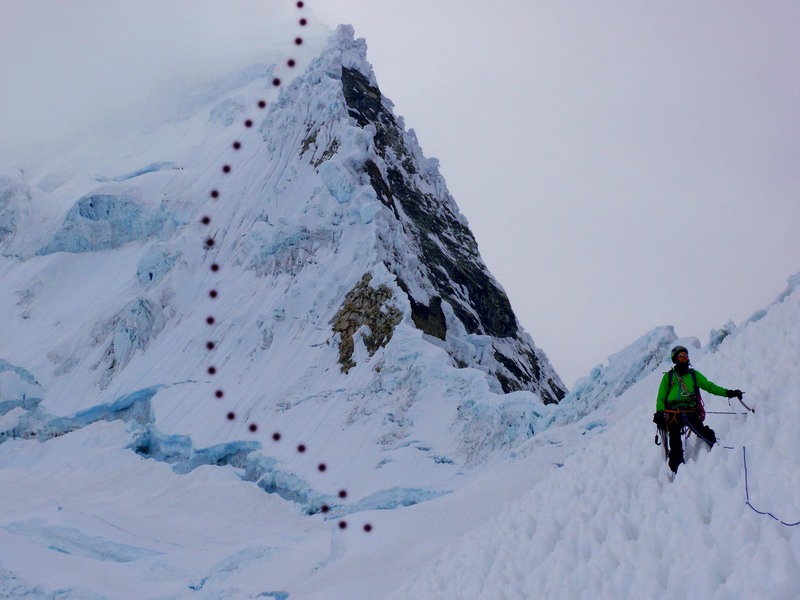 However, as usual for such kind of climbs, information is scarce and the only reliable source documenting a successfull (but an epic 7 days) climb dated from 2002, which represents ages in terms of glacier changes, rockfalls, bergschrunds… that meant that we opted for adventure and the total unknown. 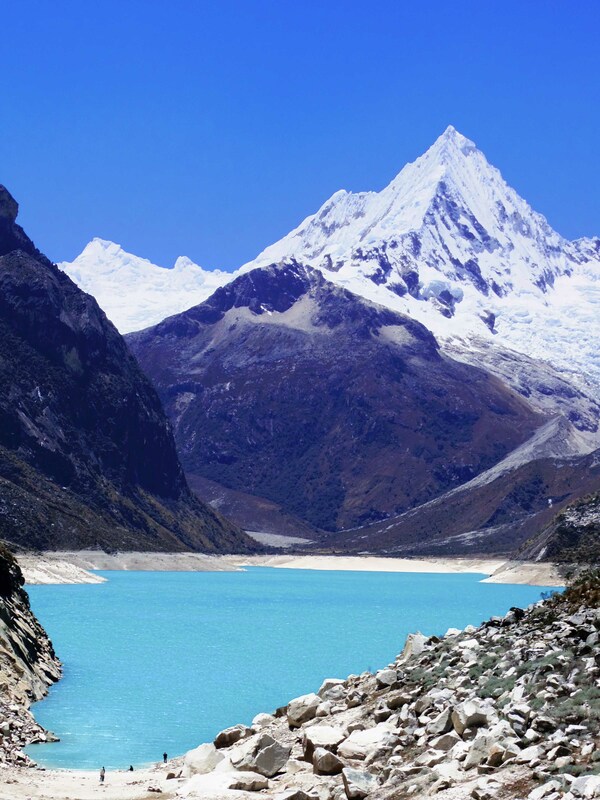 Chopicalqui lies in the Yungay Province, which is sadly known for the huge earthquake and alluvium that killed 22’000 people in the city of Yungay 40 years ago. 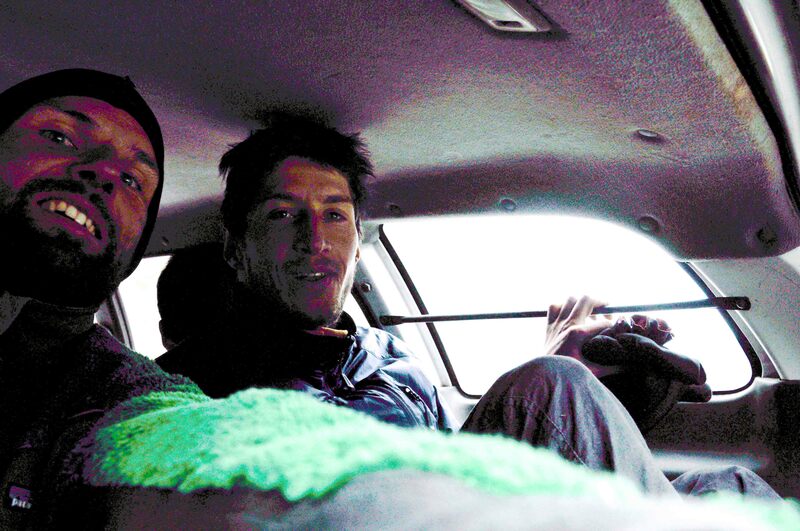 As good “gringos” we got ruled out at the bus stop in Yungay and paid for an expensive taxi drive up to the basecamp. Already in the taxi, our visit the night before to Louis favourite restaurant “La Brasa Roja” proved to be fatal to my stomach which rebelled against the short walk to the basecamp at 4300m. 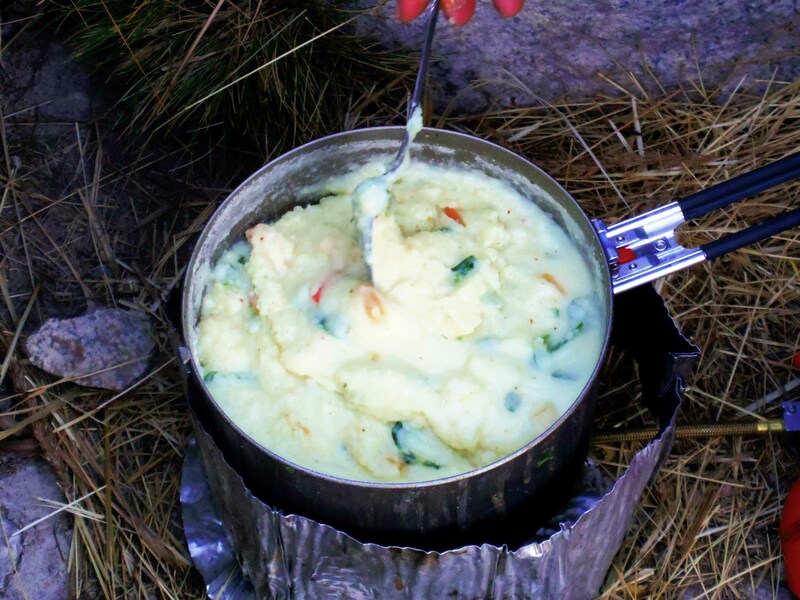 Once arrived, my stomach refused to contain any food or tea during two days, delaying our departure to the ridge. During that time, the camp was abandoned. We were the only team near Chopicalqui, only cows and donkeys fighting with us over the campground (one of them litteraly attacked Louis backpack and made our pasta and milk powder bags explode). 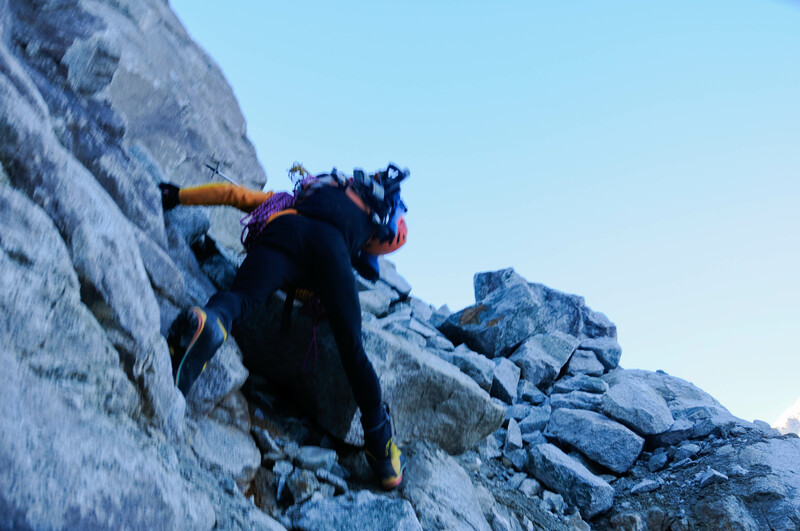 Finally, on day 3, I felt strong enough to shoulder the lighter mountaineering backpack, while we left our trekking backpacks hidden in the rocks surrounding the basecamp. 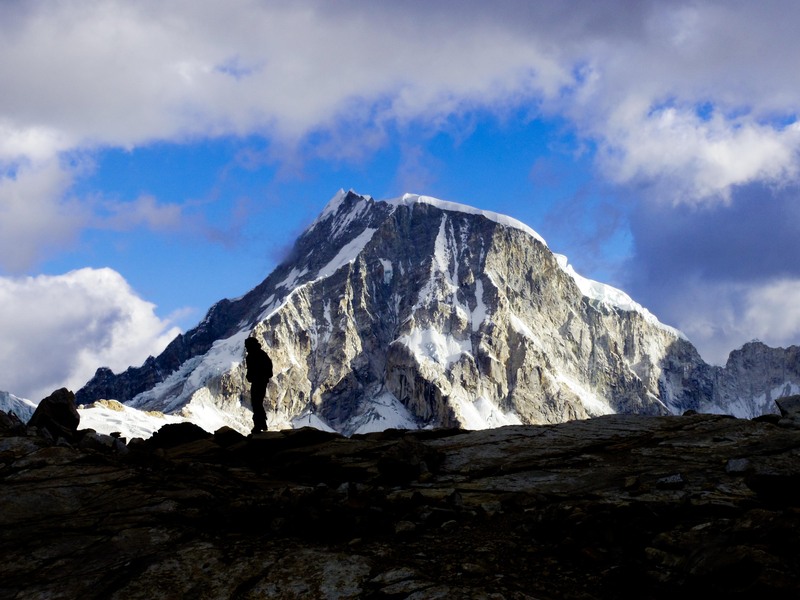 During the night, we walked up the grassy slopes in the direction of the NW ridge, overcame some delicate and slippery slabs and reached the glacier at dawn. Fortunately, while I was vegetating in the tent the day before, Louis had hiked up the opposite moraine to look for a way between the crevasses up to the foot of the ridge. 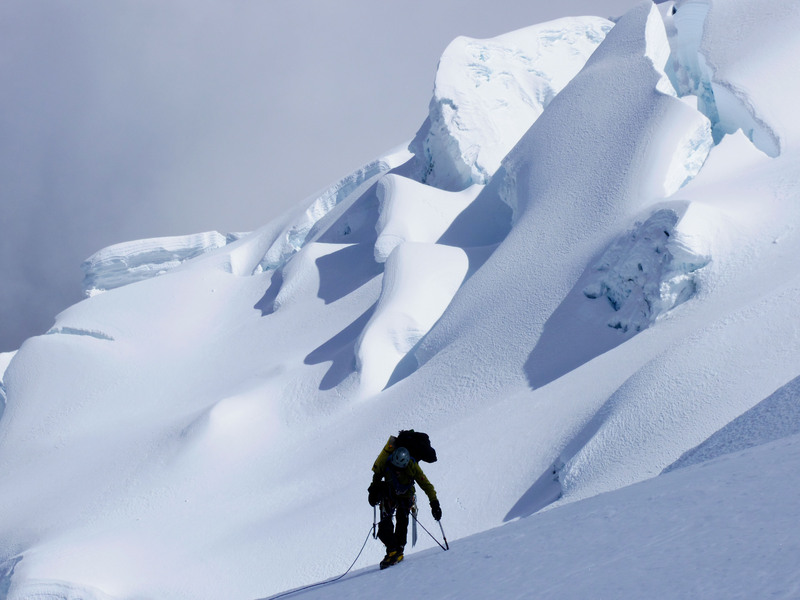 He took the lead and navigated us safely between crevasses and seracs sometimes as large as buildings. 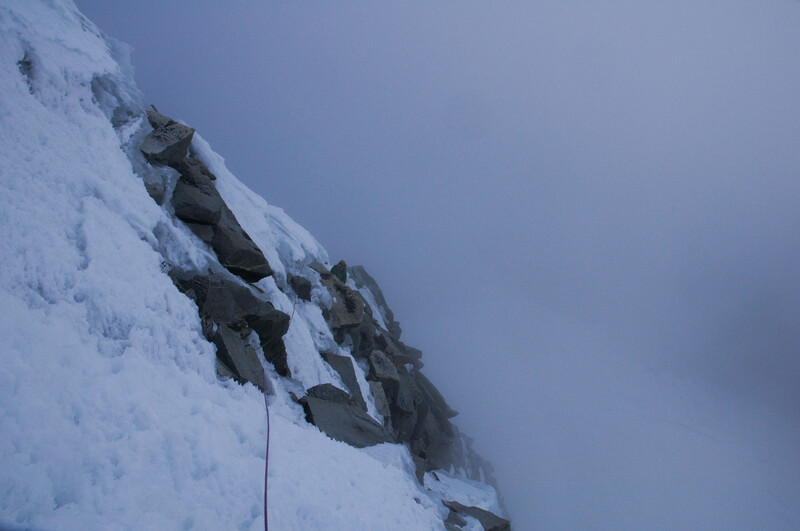 But the last meters to the ridge were barred by a huge bergschrund that turned out to be the crux of the day. 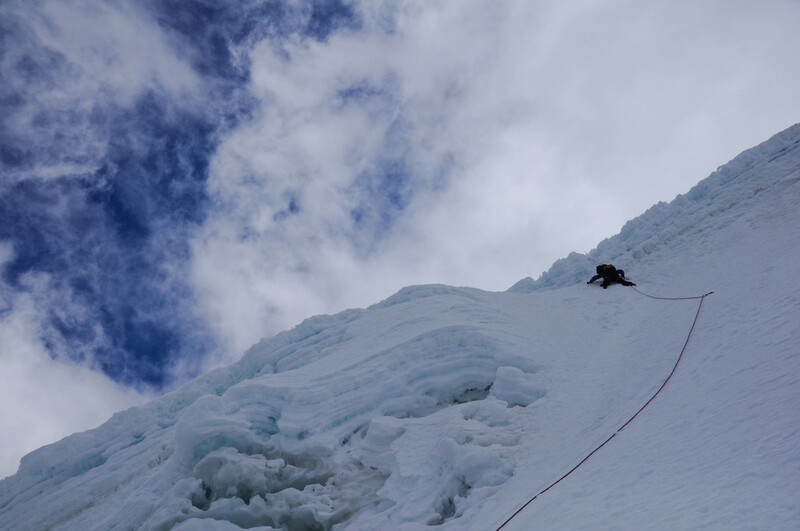 We solved it by a no-foot climb with only our ice axes in almost loose snow. During the last 3 weeks, everybody had told us that the moon was about to change and consequently the weather. So far, we had proven to be very lucky, but on this trip our luck faded out. As accurate as a watch, everyday the sky would cloud over around midday and it would start snowing gently for some hours. During the night, the sky would clear up again, yielding a cloudless morning sky and taking our worries partly away but not the new snow. 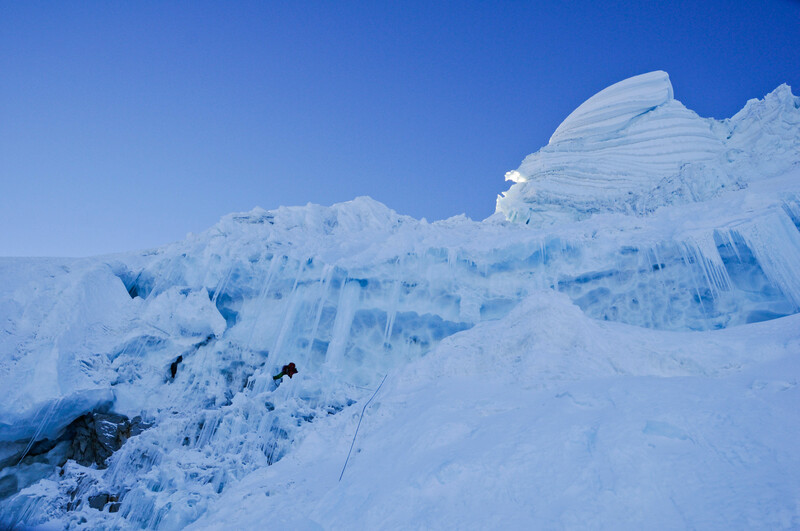 Our camp 1, just next to the crevasse. The night finally was calm but freezing cold. As we awoke, our sleeping bags were soaked from the condensation and the interior of the tent was all covered with a layer of frost. We packed our camp before dawn and soon faced the first difficulties. 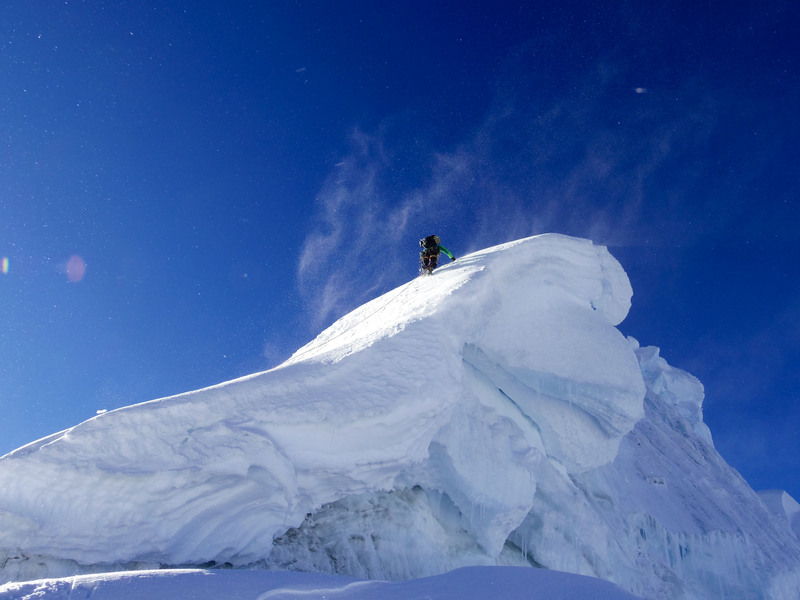 A huge bergschrund barred the access to the headwall. 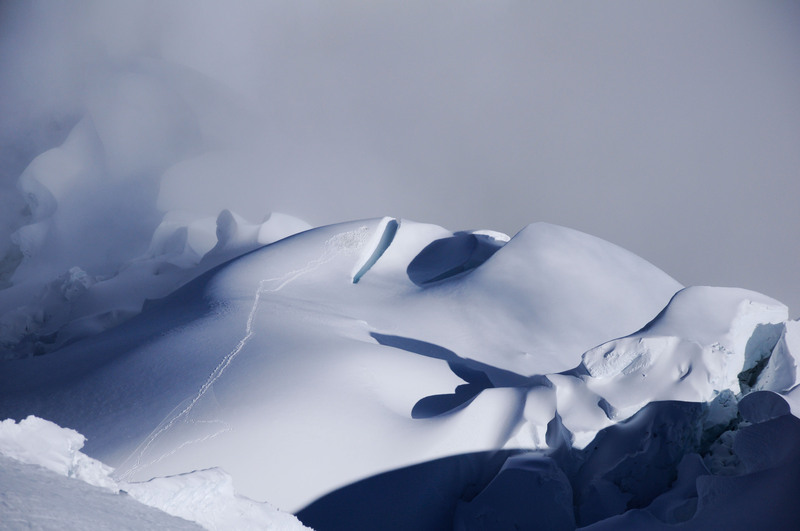 Through some ice stalactites and a debris section, the bergschrund appeared possible to climb. 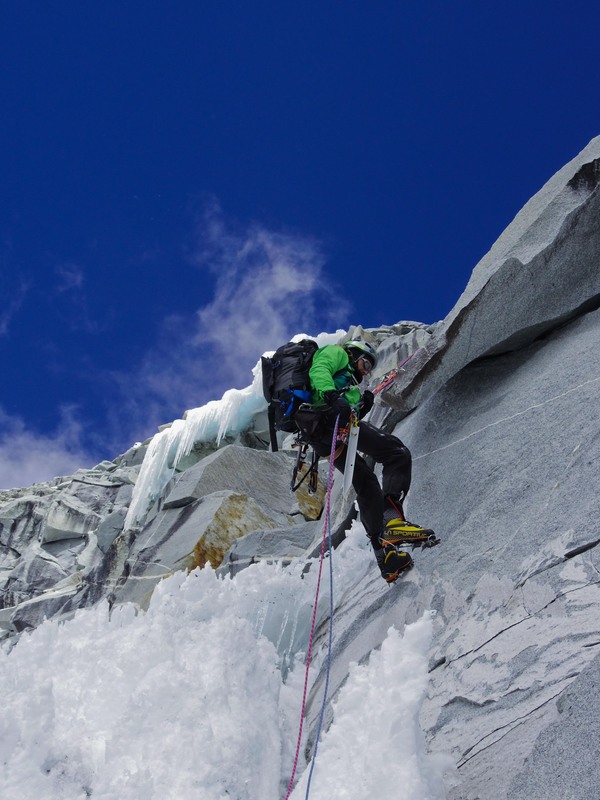 Louis led this scary pitch, placing his ice axes with care, finding only few solid holds. Reaching the ridge, he was out of gear and I took over the lead. On top of us, a huge snow mushroom forbid any passage. As far as we knew from the old descriptions, this obstacle should be avoided on the right side. However I was more attracted by the left side, that was hidden to us but already in the sun… it was gambling. If I were wrong, we would have to repeat a delicate traverse and downclimb or abseil. 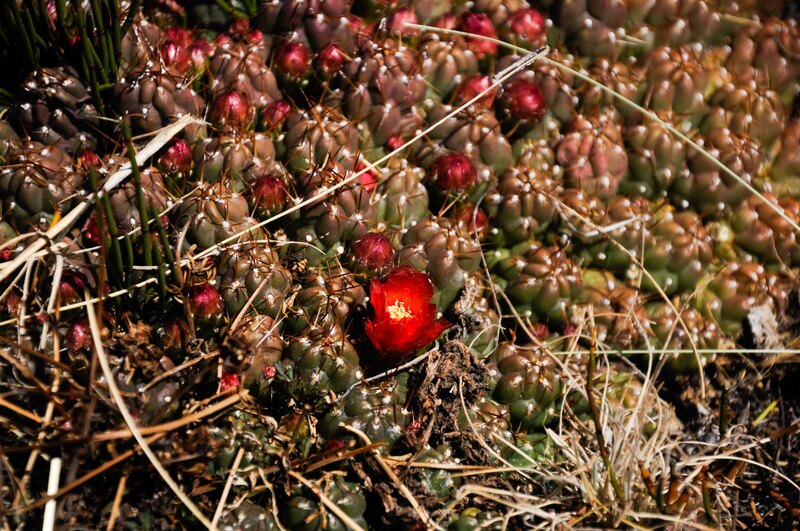 The top ridge was already in the sun and the snow already softening… I went for the sun. 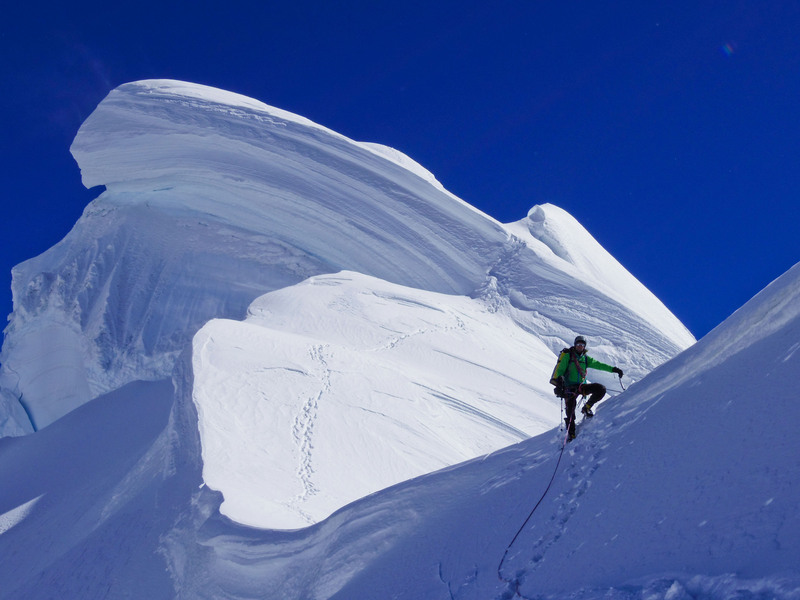 What followed was an airy climb on a razor-blade snow ridge, an abyss of vertical 1000m on the left and 500m on the right. Often the snow was loose, allowing only few solid placements. 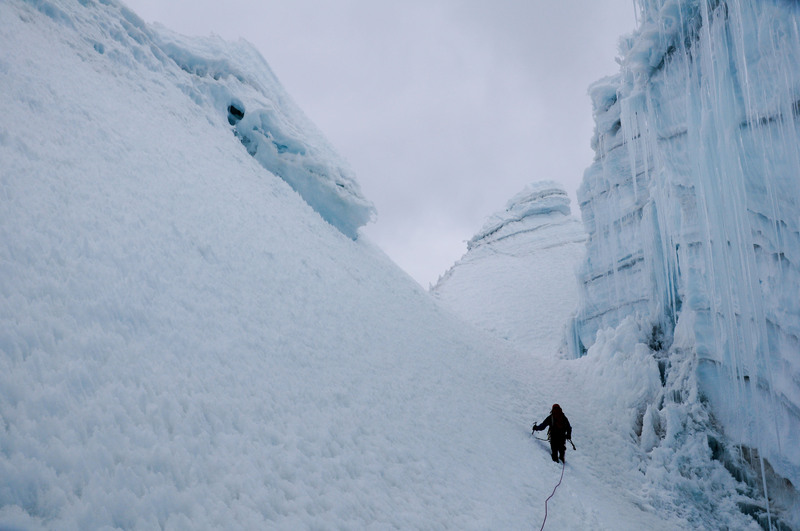 Both of us were fully concentrated, placing delicately every foot and ice axe. 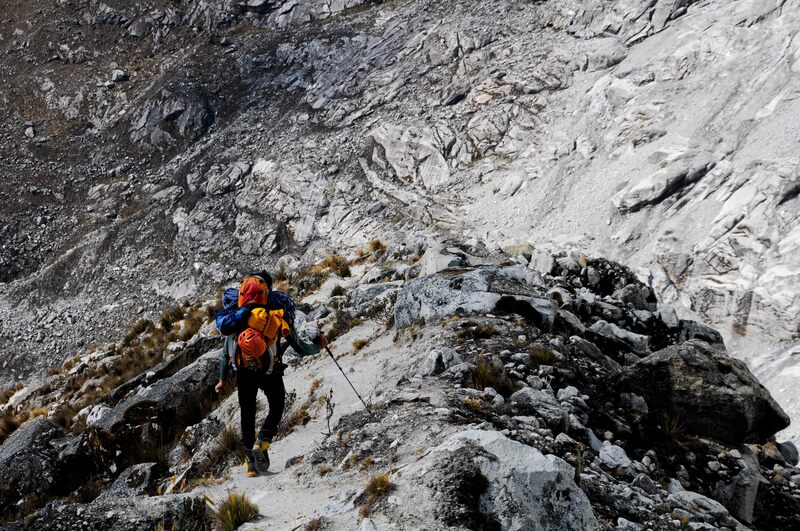 It took us 3h to reach the summit of Chopicalqui Norte and we were relieved to find a square meter of almost flat ground. It was 11am, the sky began to cloud over again and we decided to install our second camp 100m after the bottom of the abseil at around 6000m. As soon as we planted our tent, it began to snow. But that time, we were in higher spirits, our moods boosted by our route finding and the fact that the airy ridge was behind us. But difficulties still remained ahead of us and a retreat from that point would be very difficult. Another miracle made us cheer up. After preparing the Japanese noodles and melting snow, the fuel canister seemed only to be half empty! We woke up with a clear sky above our ice cave, but with a very strong wind. 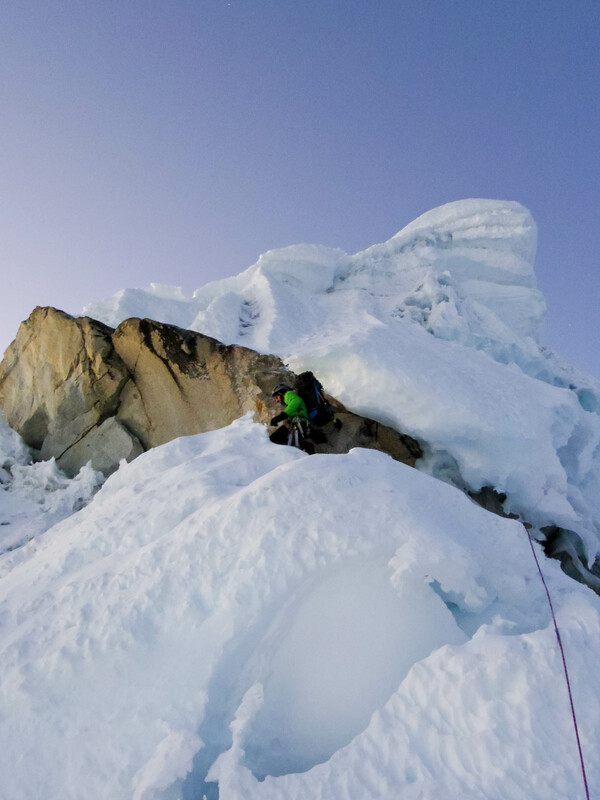 At dawn, we were again facing the first crux: a pitch with a bergschrund bridged with loose snow, mixed terrain, vertical ice and a delicate mantel onto loose snow. We were feeling the effect of altitude more and more, each movement made more difficult. 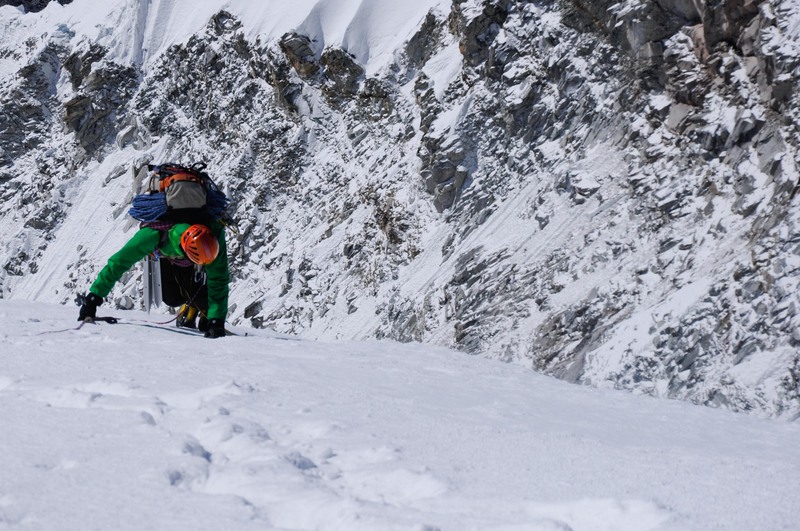 Steep snow fields followed and alternated with airy traverses on top of seracs. The knee-deep snow of the last days was slowing us down considerably, making us breath hard at every step, the wind rushing in our wide-open mouths. At 8.30am, we finally reached the summit. A moment of deep emotion after 3 days of hardship. 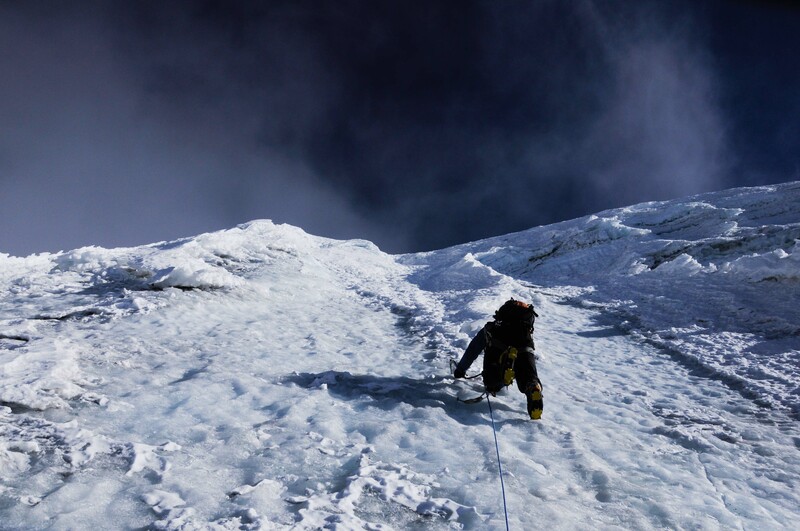 Our glory lasted for only a few minutes, the strong wind urging us to climb down. 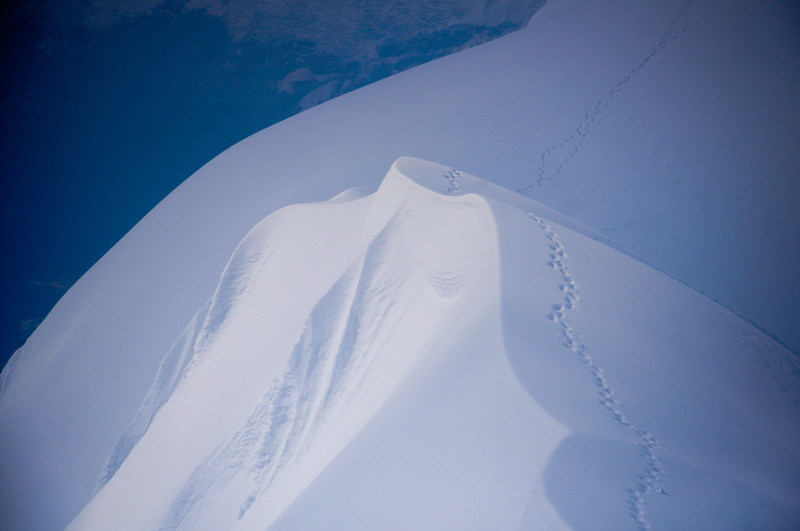 No one had been climbing the normal route for days and the old track was covered by 50cm of fresh snow. 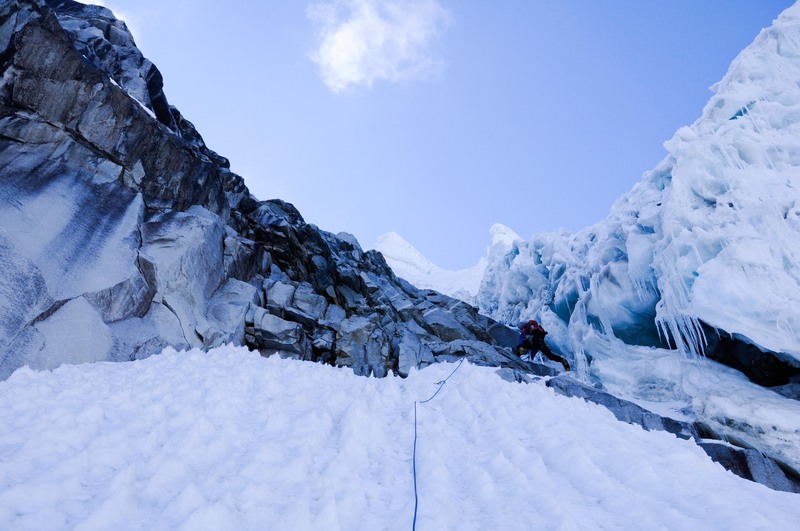 We downclimbed a runnel, abseiled once on Abalakov, jumped over some crevasses, sometimes wading hip-deep accumulations of snow. 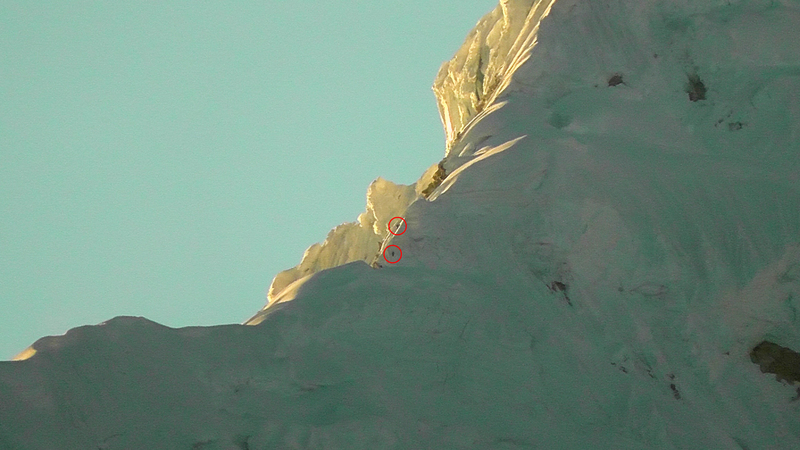 On the lower part of the glacier, a few small flags indicated the way. We were all too happy to step on the moraine since head-size snow balls were sticking to our crampons, making us walk on unstable high heels. 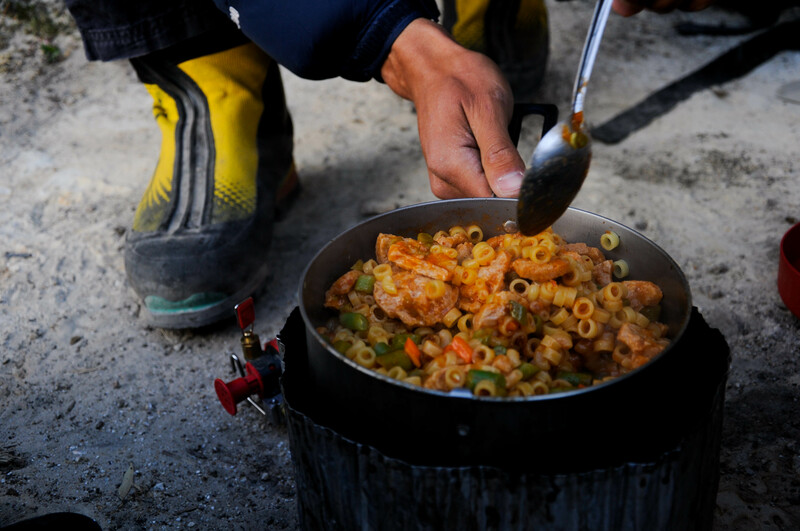 We had a break in the sun, unpacking the tent, the sleeping bags and the mattresses to dry, prepared a soup with our still half-full fuel canister! After an hour of rest, we walked down to the basecamp. Cheered up by our success, the 2h hike felt effortless. A bad surprise awaited us at the camp, though. Our trekking backpacks with gear and food were not in their hideout any more. How could that be? No other team had been on the mountain. Since we had sighted only cows and donkeys in the first two days, our first guess was that a local, either a farmer or an “arriero” had been checking out the camp. We settled down for another night, cooked without running out of gas and raised our ears to the slightest noise for the case that the theft would return. The next day, we walked down to the road 106 hoping to be given a lift, only to find out that all the traffic was in the direction opposite to Yungay. The Pisco basecamp was about an hour by foot away and turned out to be a much busier place. There, we found a taxi driving us to the National Parc checkpoint. 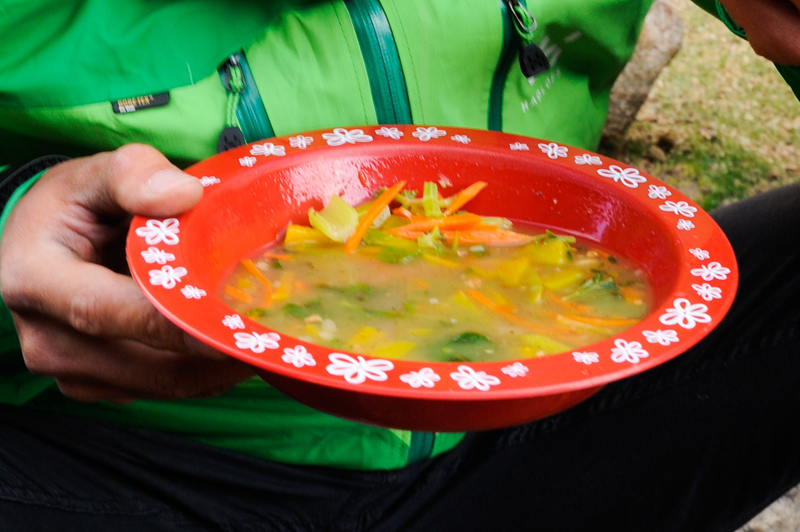 We told the story of the theft before taking a “collectivo” back to Yungay and to Huaraz. Chopicalqui in Quechua means “fits in the center”. We will try to take it at face value, remembering in first place our 3 days on that magnificent mountain and putting the unfortunate loss of our backpacks aside. One late evening at the Galaxia hotel (our first hotel in Huaraz before B&B My House and La Casa de Zarela) after a rich supper, Andy passes by. We dress up and together we walk to playgrounds 200m away from the hotel. The rumor that was audible from the hotel has turned into the powerful and rythmed sounds of a music band with brass wind and percussion. On a basketball court, people are dancing, only illuminated by streetlights. On the lawn, next to the basketball court, a 10m high structure made of thin wooden sticks is standing. We join three friends of Andy who soon hand to us a bottle filled with warm, sweet, alcoholic drink. 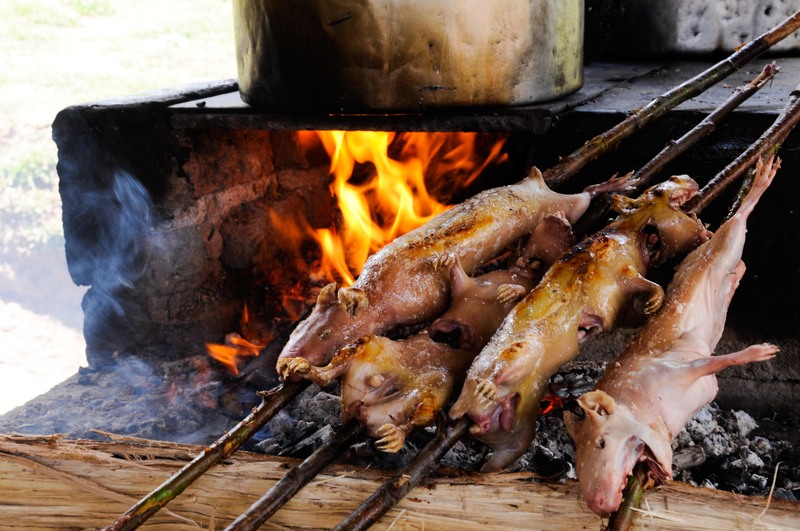 It is called calentito and is made of Pisco, honey, dates and different spices. You fill a shot glass of it and pass the bottle to the person next to you who will wait until you have emptied your glass to help him- or herself. Waiters bustle about, bringing filled bottles to people and taking away empty ones. They all are celebrating La Virgen de Chavin, the patron saint of a city located 80km away bird’s-eye on the other side of the Cordillera Blanca. At 12pm, four men start running and shouting among dancers and groups of people. Above their head they carry boxes looking like accordions but which belch flames and sparkles instead of music notes. After the vesuvius-accordions have died out, the pyrotechnists move to the curious structure and set fire to wicks hanging down below it, kicking off 20min long fireworks. Stage by stage, the structure bursts into flames, with explosions, fire wheels, rockets, vesuvius, … the band keeping on playing in the background like in a light show. Getting information about routes and conditions is a continual challenge. 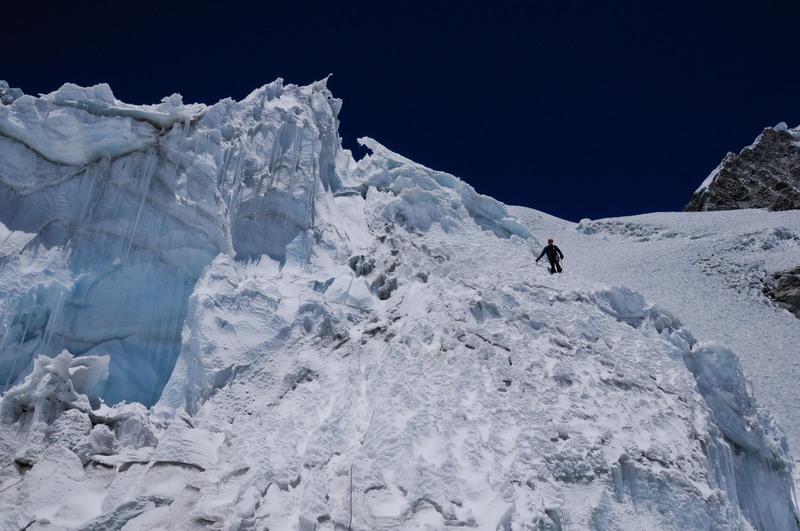 Since routes on the high peaks of Cordillera Blanca are principally ice climbs, their practicability can change from season to season and sometimes from week to week (snow bridges over crevasses or bergschrunds, serac avalanches, …). In Huaraz no websites like camptocamp.org, ohm-chamonix.com, bergtour.ch provide up-to-date news and mountain hut wardens cannot be joined by phone (there are a few “refugios” spread over the mountain range). Andy, the contact of Marius and hobby moutaineer gave us some good tips based on his experience and knowledge of the region. Additionally, we consulted two guides working for agencies and from whom we rented gear (tent or “estacas”). 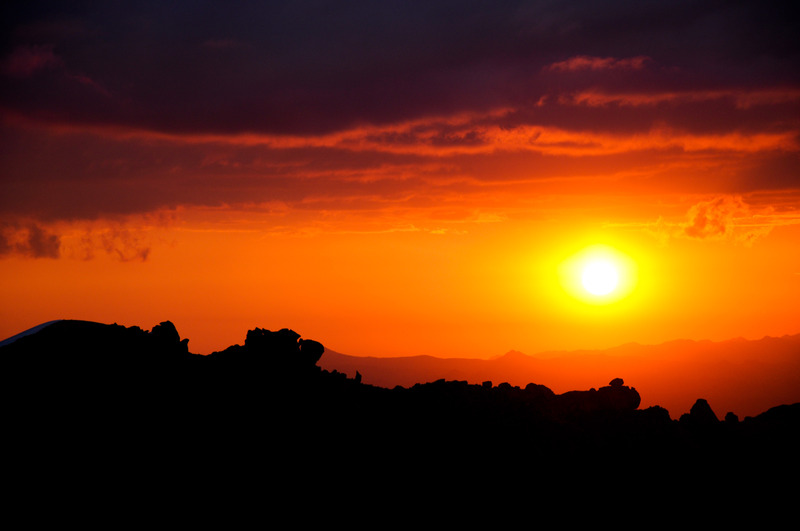 They could give us good advice on classic and popular routes that they are climbing regularly with clients. We also discussed with people met on the mountain (Peruvian guides (who you easily recognize by their green Mammut jackets, their small body heights and their alarm clocks set on 1 am) or other mountaineers (two Swiss girls, hurried New-Yorkers because they have only 2 weeks holiday, altitude sick Australians, a stomach sick Argentinian, an experienced Catalan, a British paraglider, French trekkers, a Japanese just having experienced whiteout, … (note the majority of Europeans)). 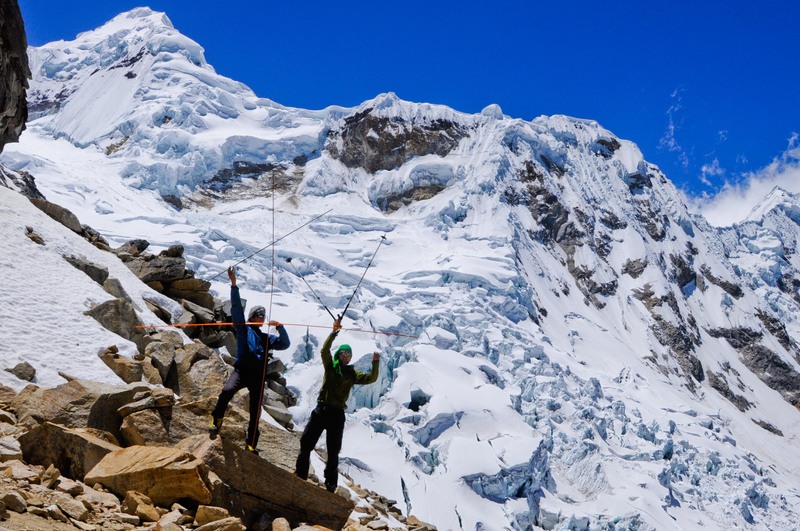 We also asked Zarela for advice, the owner of the hotel “Casa de Zarela” who hosts many climbers staying in Huaraz and the youth SAC expedition team who were very active in the Paron valley from mid-July to mid-August (thanks in particular to David Hefti for his explanations). Finally, we regularly stopped by the “Casa de guias” (like in Zermatt!) hoping for a guide to be there. Last week, the long-haired, young guide on duty at “Casa de guias” was particularly helpful and enthusiast. 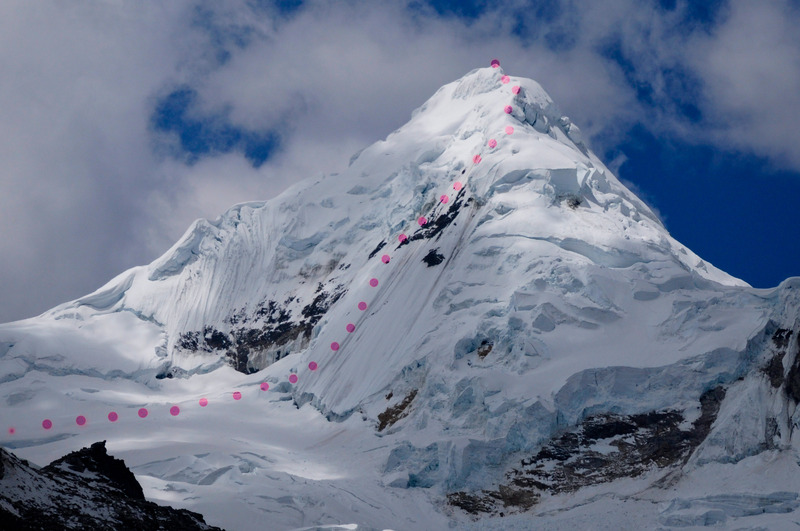 From him (and Zarela too) we heard that the NE ridge of Ranrapalca (D+, 700 m) (6162 m) had been attempted three weeks earlier and that he recommended the direct route in the SW face of Tocllaraju (D, 600 m) (6025 m). That decided us and the next day we took a taxi to Pashpa, hired an “arriero” and one “mula” (40 soles + 20 soles per day) and hiked up to campamiento Ishinca at 4360 m. On day 2, on our own (meaning carrying heavy backpacks), we set the camp on the glacier below the pass between Nev. Ranrapalca and Nev. Ishinca at 5300 m.
At 2 am on day 3, leaving the tent, the sky was partly cloudy. We walked up to the pass encountering the first “penitentes” sections that we will qualify as medium (up to 1 m high). We climbed easy rocks and walked up the NE slopes in the direction of the ridge crossing new “penitentes” sections (medium and large (up to 2 m high)). 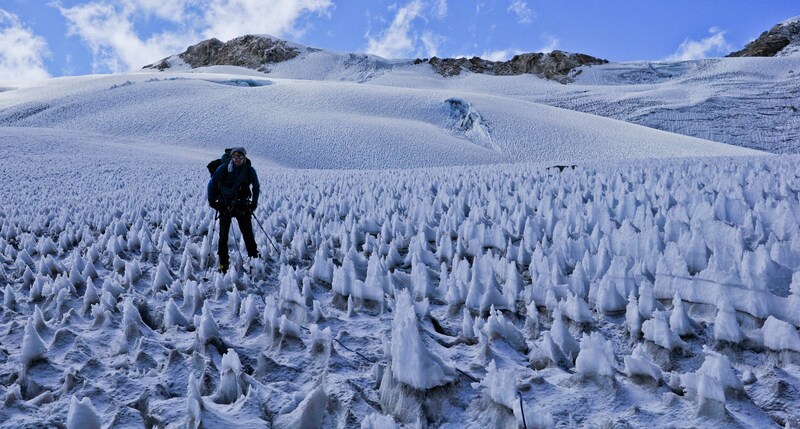 At night, the “penitentes” are frozen and only the tips or the thinner ones are likely to break. The lowest point between two “penitentes” does not collapse when you step on it and you can hold on to them when climbing between two. Walking through “penitentes” feels like running an inclined 100 m hurdles, but with a hurdle every meter. 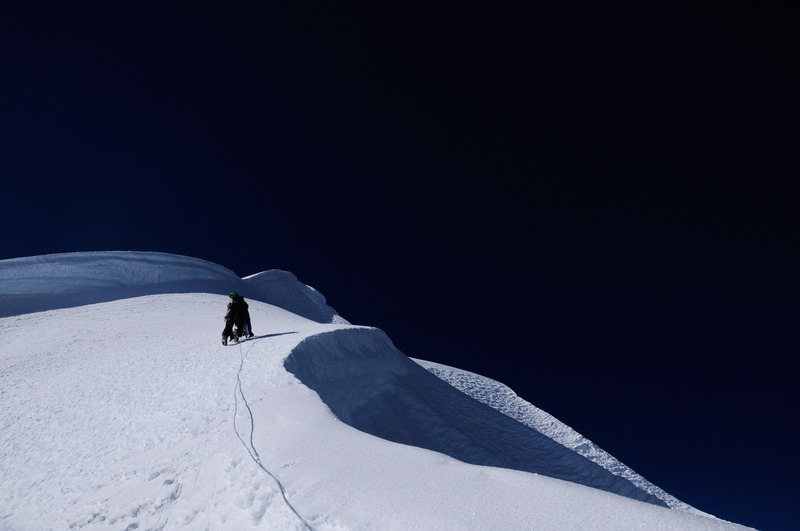 At 3.30 am, we got on the ridge over a steep snow slope. We followed the craggy NE ridge over not so steep but exposed rock, snow and icy sections (that reminded us the Täschhorn-Dom traverse) until we hit against the final step before the top plateau. We climbed it left of the edge, first over pleasant mixed terrain (good rock and good ice), then over snow and icy slopes. On the top plateau, another craggy ridge alterning rock and (sometimes loose) snow sections still separated us from the summit. We stood on the summit at 8.30 am, enveloped by thin clouds as during most of the climb. We unclimbed the top ridge and abseiled twice in the direction of the NE slopes, releasing loose rocks and nearly blocking the rope. 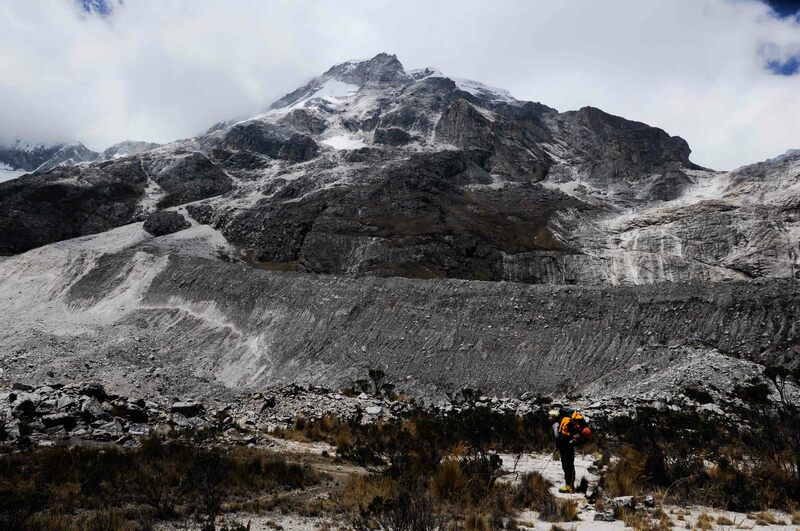 The next couple of hours were particularly stressful, finding our way in unknown terrain, through medium to high “penitentes” softened by the sunlight and thus collapsing at the first contact. 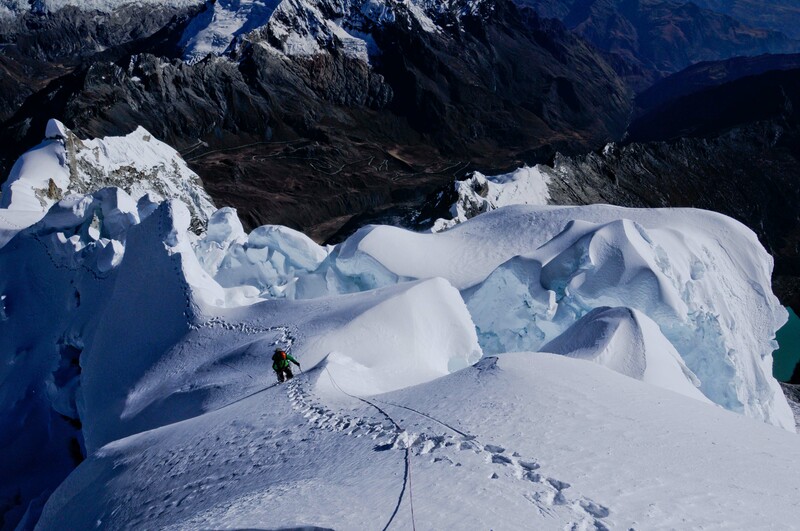 Our track zigzagged through crevasses and seracs, the snow cover softening in an alarming way. 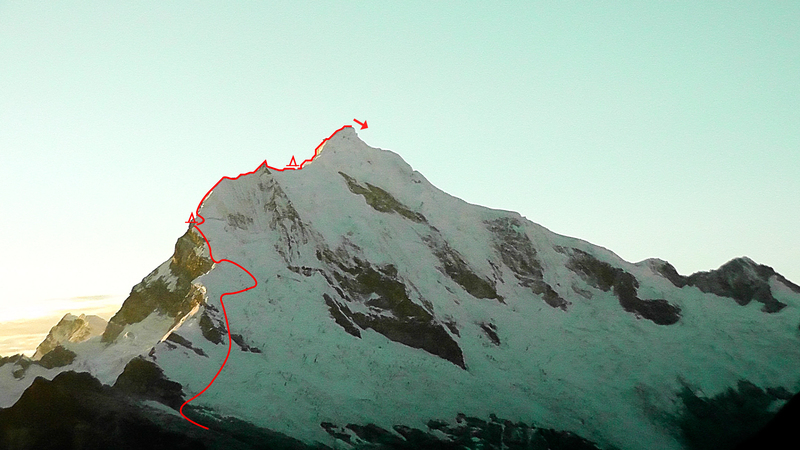 After numerous unclimbs, indirections and one abseil down a serac, we could link up with the morning track. At 1.30 pm, after 11.5 hours of climbing and fighting against “penitentes”, we slipped into our sleeping bags for a regular nap. 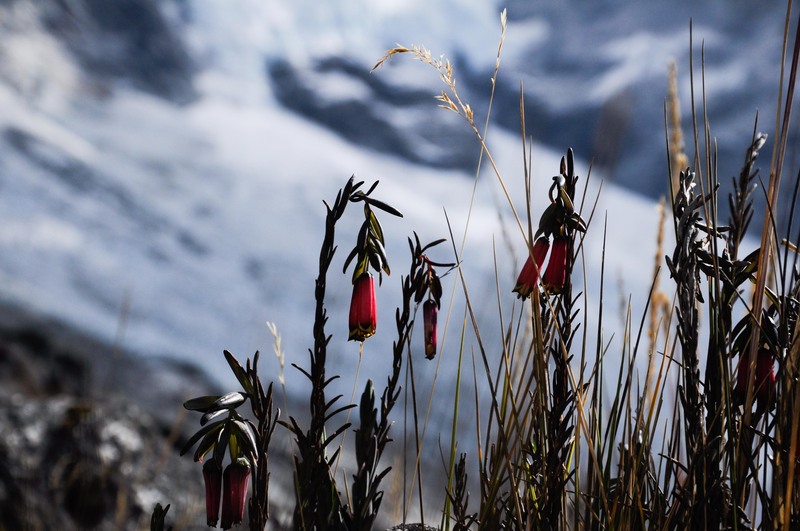 Day 4 was our day of rest according to the plan, meaning: dismantling the camp, walking down 950 m elevation to campamiento Ishinca, packing food left at the “refugio” and hiking up 650 m elevation to the high camp of Tocllaraju at 5000 m. At the camp, we met three Peruvians listening to music and accompanying one Italian filming for some RAI documentary. Mini mountains of moss, even with trees! On day 5, at 2 am, we left together with our “tent neighbours”, our routes separating at 5400 m. The wind was strong and we could never get warm in spite of 4 clothing layers and repeated efforts to enhance blood circulation in our fingers and toes. 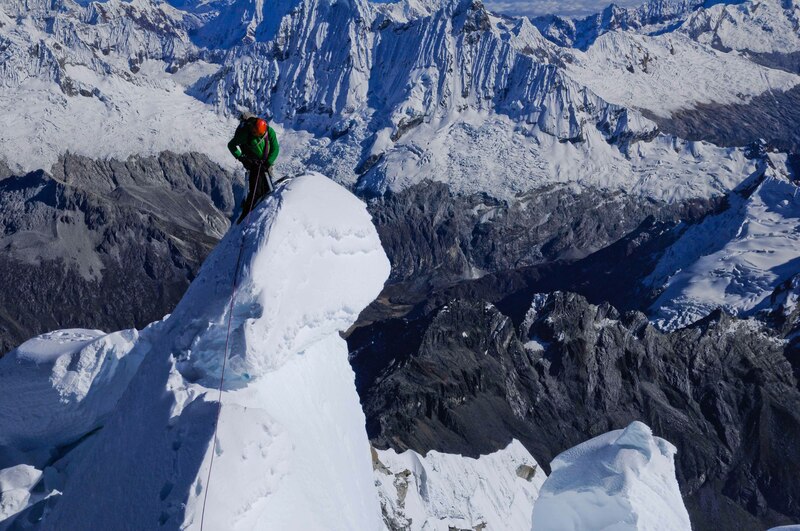 We simulclimbed without rest, reaching the top ridge at sunrise, the sky perfectly blue and the wind as strong as ever. 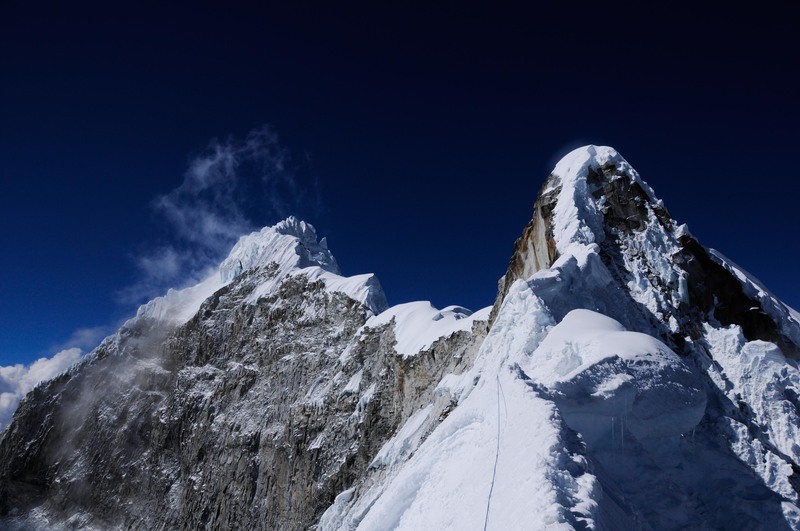 At 6.40 am we stood slanted on the summit, at 6.42 am we were preparing the first abseil, passing the Peruvian-Italian team in the top slopes of the W ridge. Since I knew the way down and since the wind was not getting weaker, we made no break until the camp, unpacking untouched food and drinks at 8.30 am for a late breakfast. 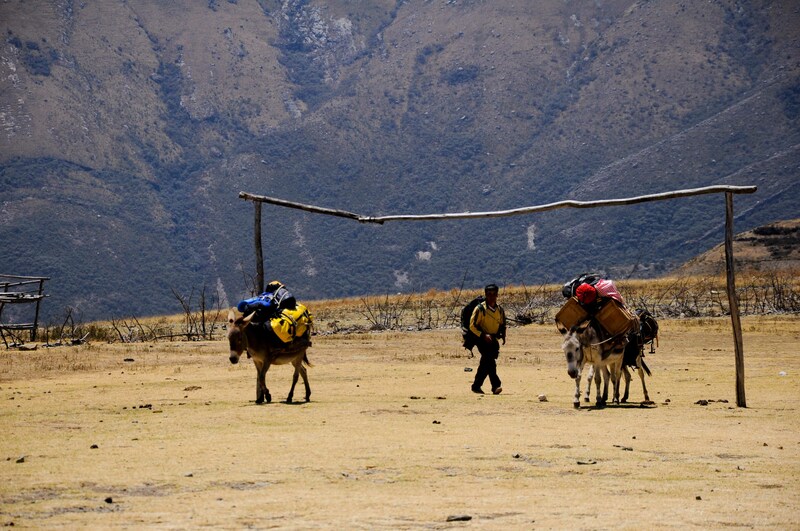 Our “arriero” on the local soccer field. The day before Peru held Argentina at bay 1-1. Some more pictures can be found here. Choosing which summit to climb is not an easy task and in our case it requires in average 2 days to prepare our minds, packs and stomachs. Since Marius had to leave back to Chili, this time Louis and I were on our own. 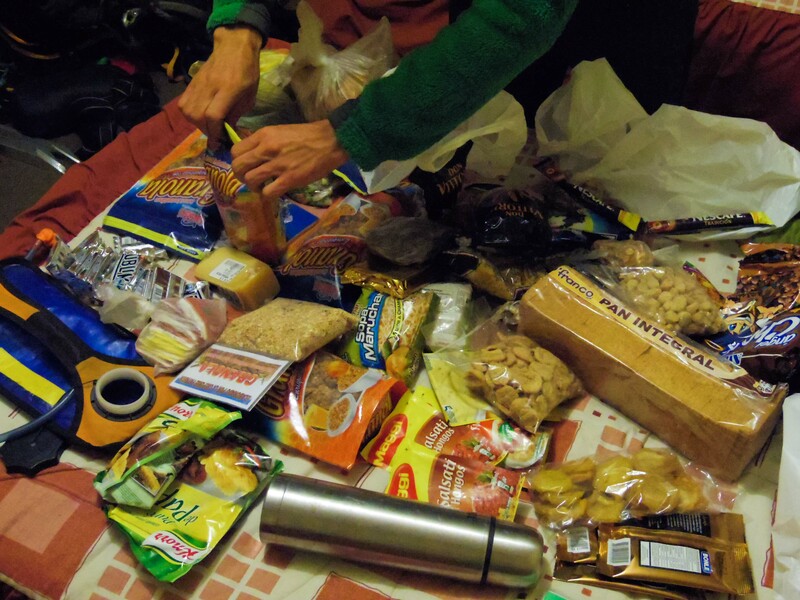 Heavily loaded with food and gear for 5 days we set off for Artesonraju (6025 m), one of the unconsciously most famous summits in the world (it inspired the logo of the Paramount Pictures Studio). Being tired of the long “collectivo” travels, where people are rather considered as sardines than 1m82 tall Swiss mountaineers with over large backpacks we decided to attempt two summits in one stretch. The Piramide del Garcilaso lies next to Arteson and offered interesting enough lines so our choice was obvious. 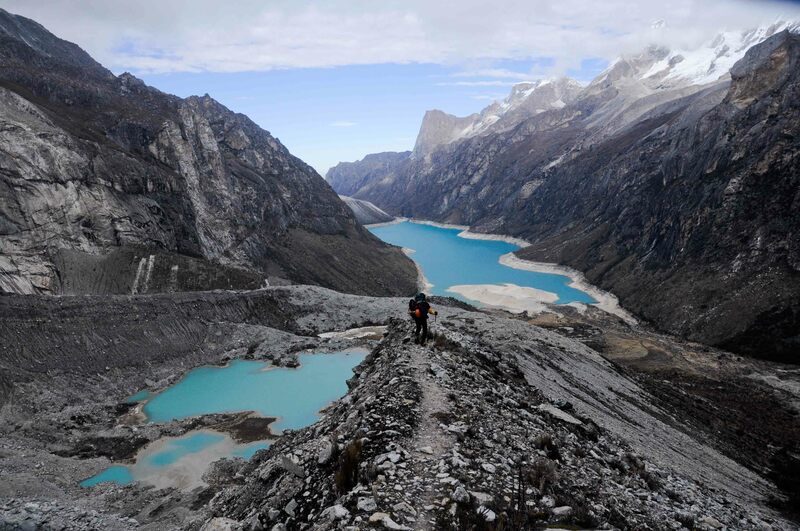 After the usual bargaining with the taxi driver, he accepted to drive us for a reasonable price (80 soles ~ 40$) to the turquoise Laguna Paron, the largest lake in the Cordillera Blanca. Following the lake shore the path slowly started to climb decently on a abrupt moraine. 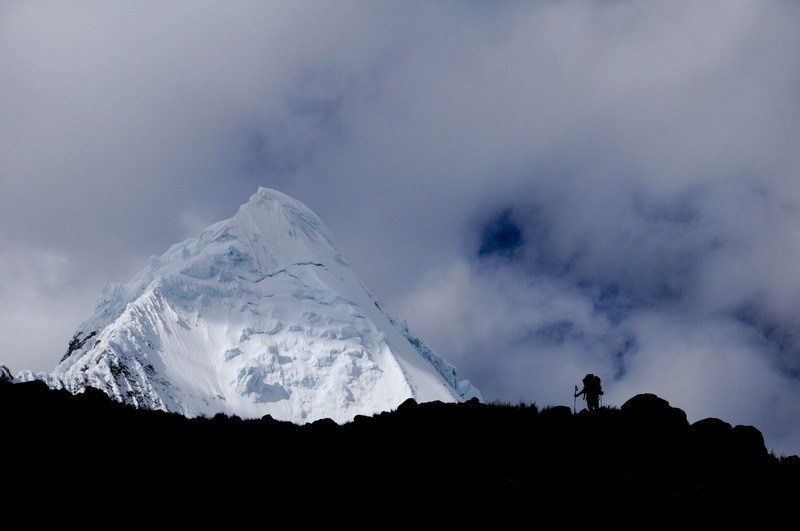 The landscape is offered to us in a dramatic manner, soon Arteson appeared in front of us and the Paron glacier. For once we were happy to set our camp on dry and not frozen ground, with the embarrassing snow melting. 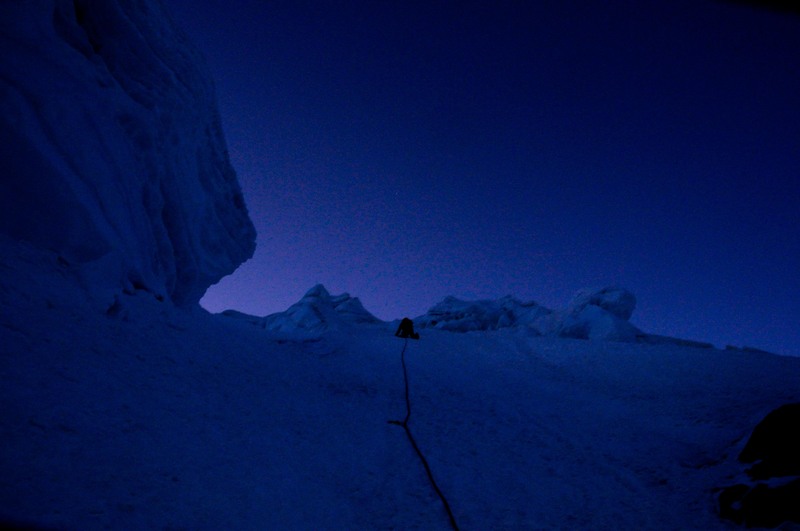 The night was clear, and as honest Peruvian climbers in Peru we got up at 1h only to discover that our Swiss friend with his guide were already within the technical section of Arteson. 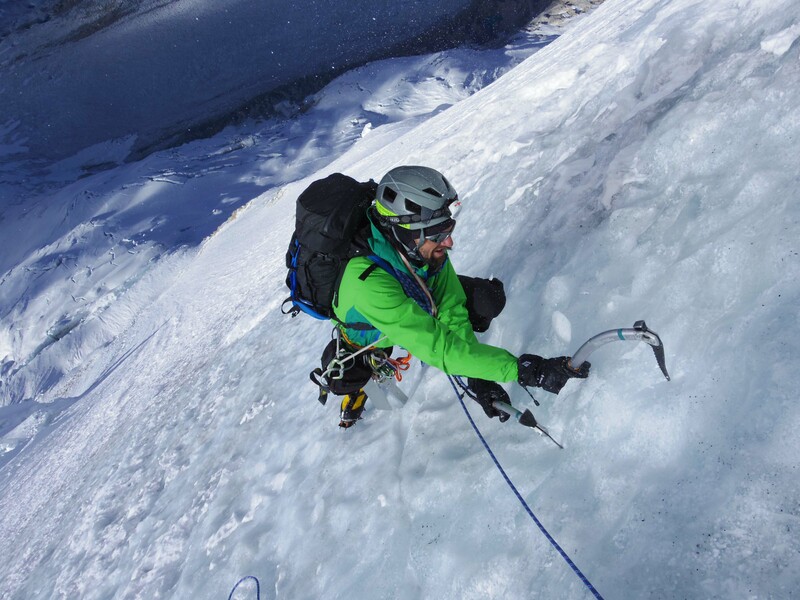 We hurried up across the Paron Glacier, slalomed around the crevasses at the foot of Arteson to be finally confronted with the 700m high South-East face. Darkness let us believe that the summit was not too far, but the weak light of the other team’s headlamps taught us differently. The snow conditions were good, soon the sun was highlighting the whole face of the mountain and our fingers finally awoke from the cold. 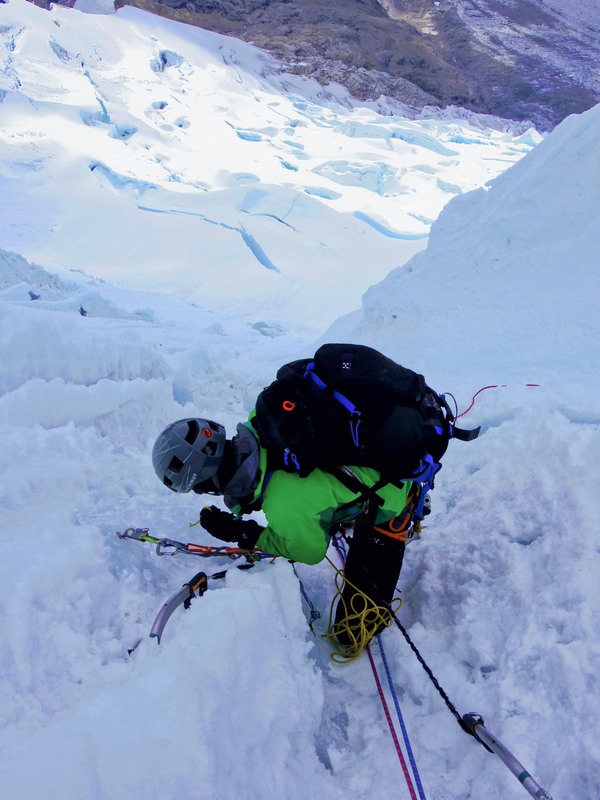 The “estacas“, a belay device often used in the Andes proved to be very usefull to make quick progression. Ice appeared only on the last pitches, that slowed us down since we had to stop simul-climbing. Our summit was just topping out of the clouds, at moments, clearing the view over a boundless sea of clouds and other mountain tops, which was even more breathtaking since we were exhausted from the climb. 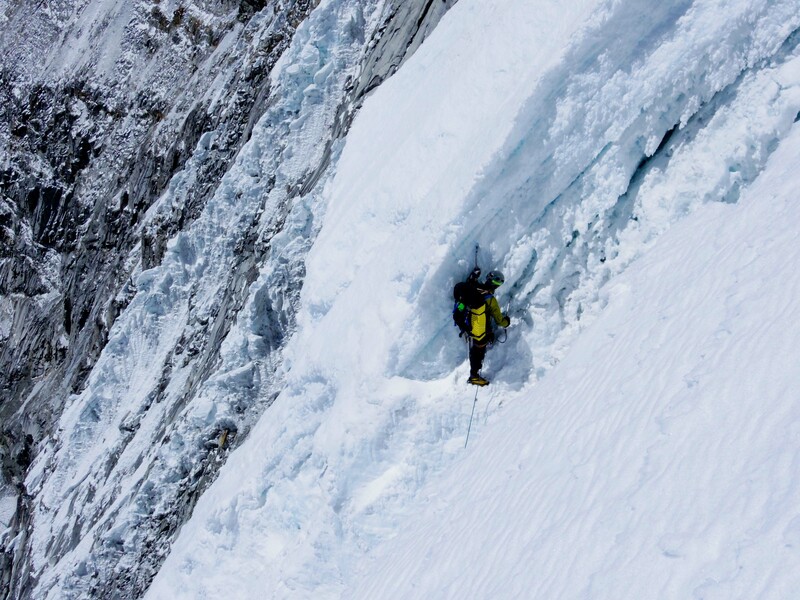 The 700m of abseils seemed eternal to us but finally we reached our camp without incidents. 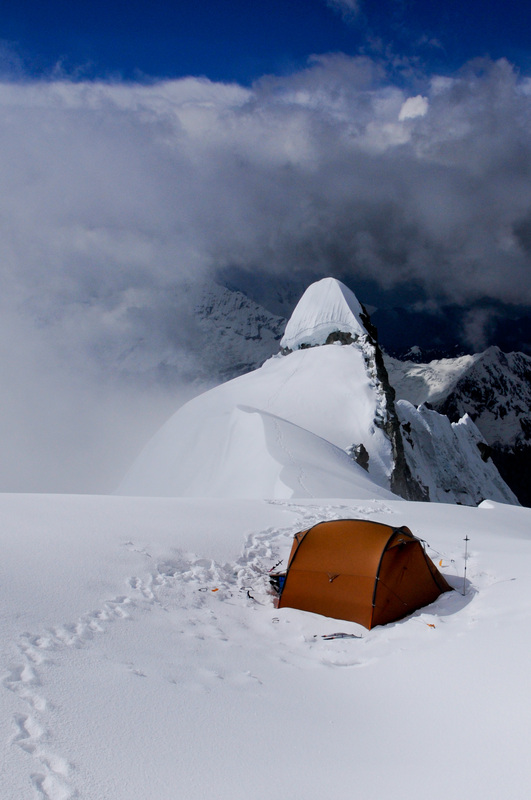 We decided to spend the night at the same place and only to hike to the Piramide high camp the next day. The initial plan was to climb the Piramide from its South face, since the technical climbs from the North-West face seemed to us rather dry and unfriendly. 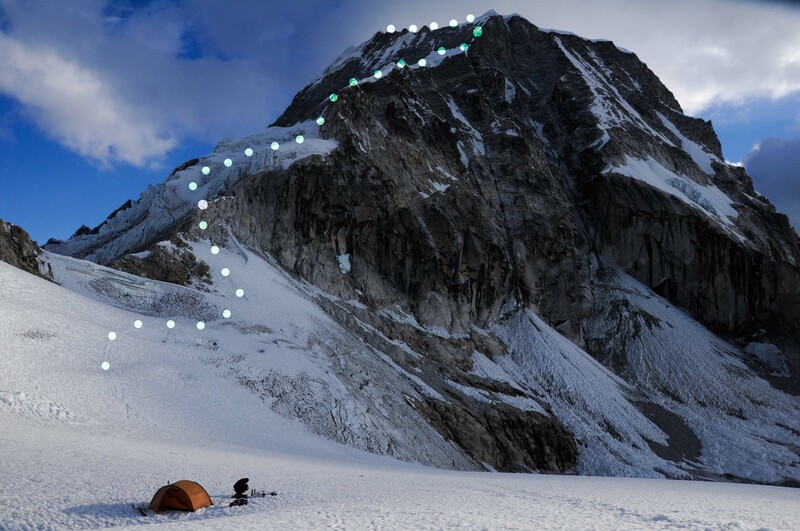 Though, arrived at the new campsite we soon discovered impacts on the snow fields of the “canaletta” on the South face that would have been our route, which were due to a serac hidden in the cloudy upper part of the mountain. 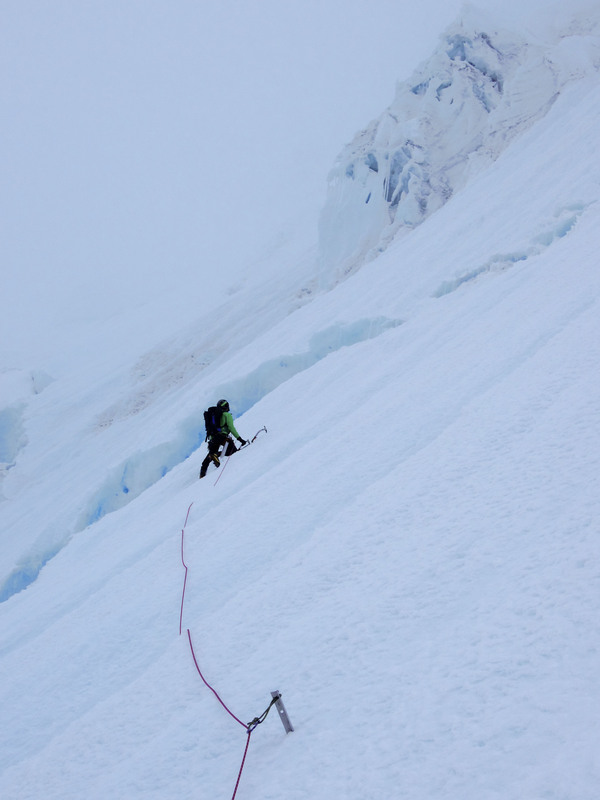 We changed our plans and our choice finally fell on the West ridge, however the conditions of which were not very clear. Nevertheless we decided to see on spot and settled for the night. Sleep came at once, only to be awaken by hard winds that threatened to tear apart our tent. A departure at 1am seemed impossible, we changed the alarm to 3am, but the wind kept on blowing as strong as ever. 5am passed, 6am finally the wind gave in. Torn between the decision wether to leave or to stay, we hurried with the preparation and left the camp. The sky was still cloudy and the summit invisible. 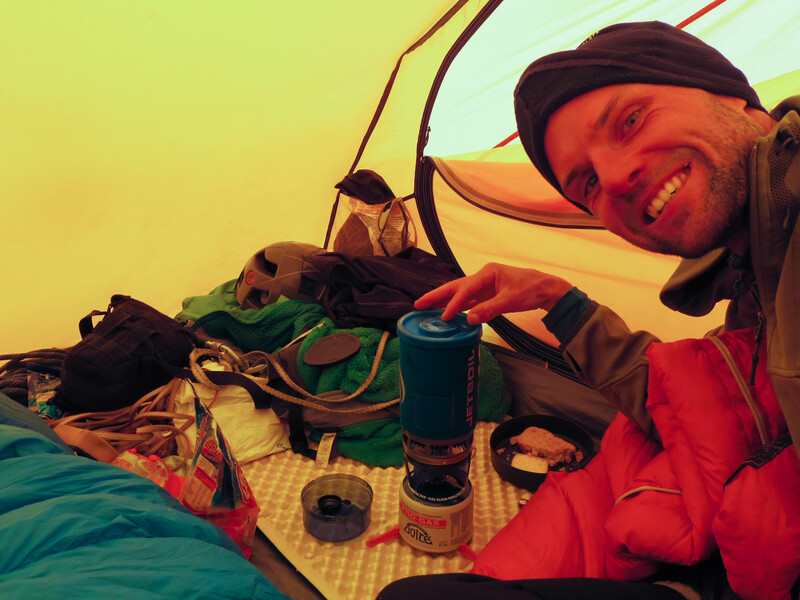 Suddenly it started snowing, our motivation fell below zero and we returned the 100m to our camp and the warmth of our sleeping bags. At 8am the sky cleared up again, and we were back on the track. Come what may, at least we’re going to have a try! 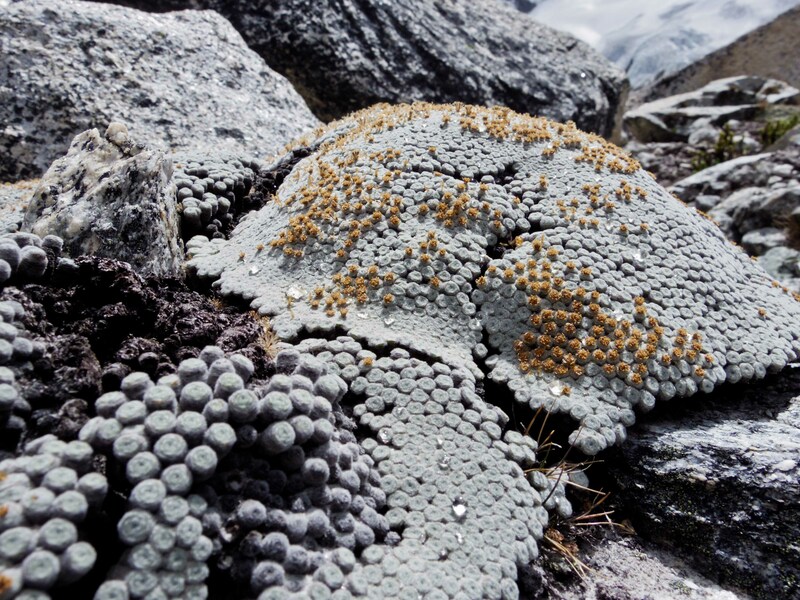 Soon enough we reached the pass and observed the ridge: An inconsistent sequence of big snow mushrooms, dry rock shoulders, narrow edges,… impossible. 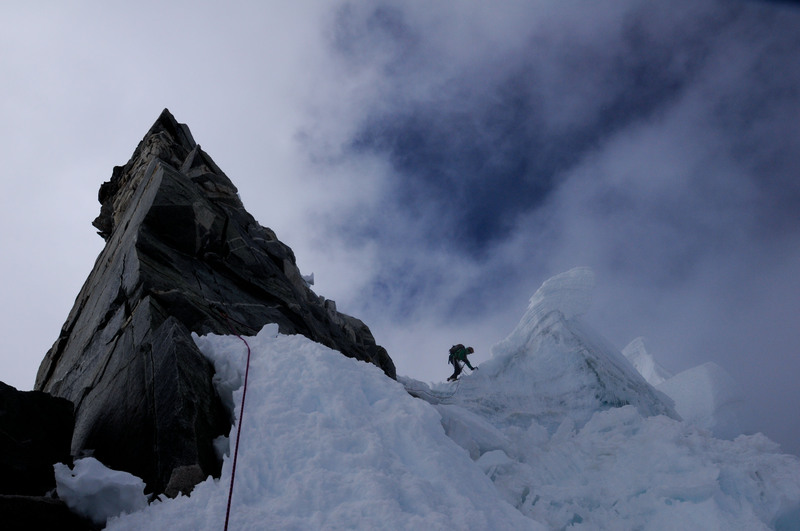 The sole way up for us seemed to be a “canaletta” that wriggled upwards between overhanging seracs, over several Bergschrunds, only to reach the West ridge halfway up to the summit. 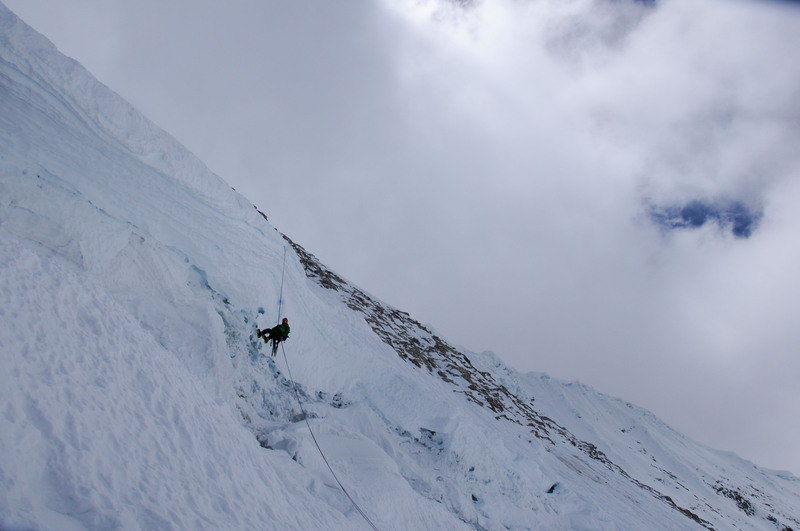 The climb was steep, in average 70° with vertical sections when we were about to change from channel to the other. 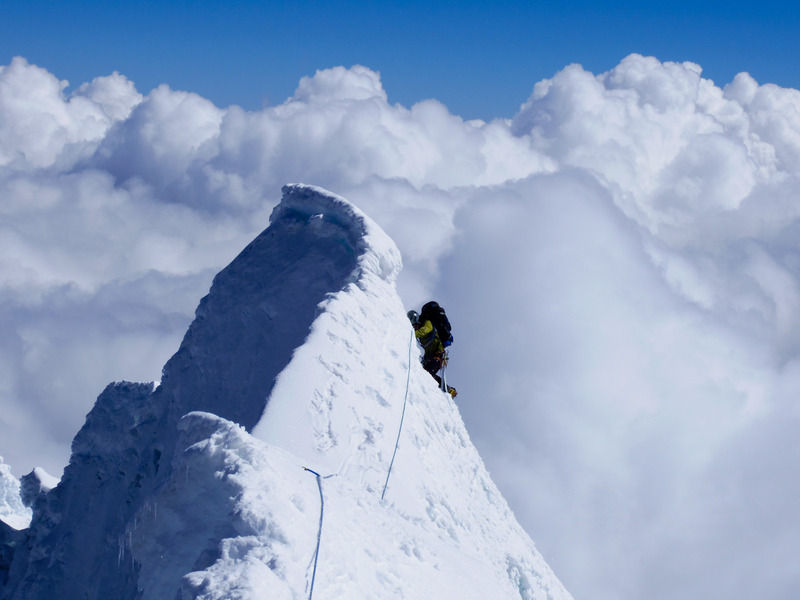 Soon we too were climbing in the clouds, hardly seeing each other and tired we finally reached the ridge. 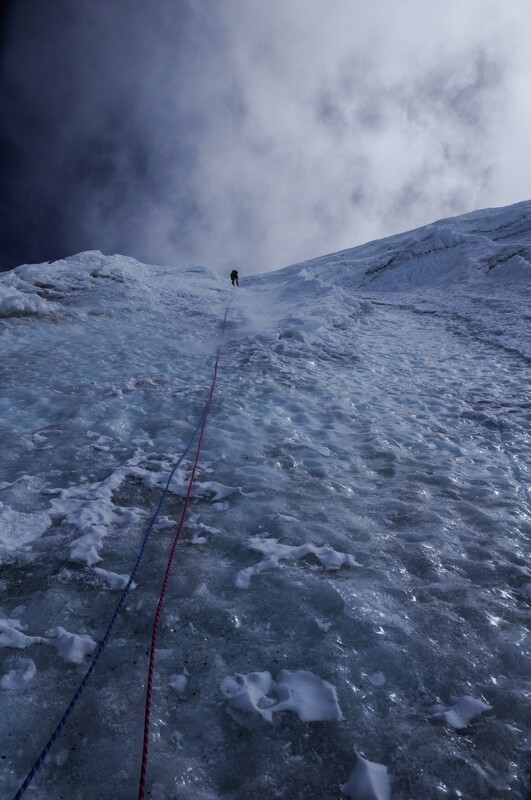 It was 2pm, 4 hours of light left, 300m to the summit, the only distinguishing feature was Louis in front of me… we gave up and started the abseils. Unlike the classical routes we had to equip the belays ourselves, using estacas which we left or Abalakovs. Just before dawn we reached our camp, preparing our food and falling asleep instantly. We were happy that we gave it a try, even though we did not reach the summit. One problem remained. Laguna Paron was a tourist place and in the high season a lot of taxis drive up tourists for short walks along the lake shore. However September is not any more high season in the Cordillera and visits to Paron become more rare. Arriving at the parking lot at 11am, we pulled a long face, not a single car! In other words 15km of walk only to have a single bar on our cell phones… Desperately we prepared a tea, ate our last piece of chocolate and got ready only to find a taxi with three clients coming our way. YEEESSSS! – makes us walk or in other words what is energetic and balanced from a nutritional point of view. and almonds/nuts/dried fruit chocolate for dessert. but this is another post. Some more picture can be found here.